The exciting first day of the European Forum on urban forestry 2016 is behind us! We have gathered today’s highlights for you in our new blog post. 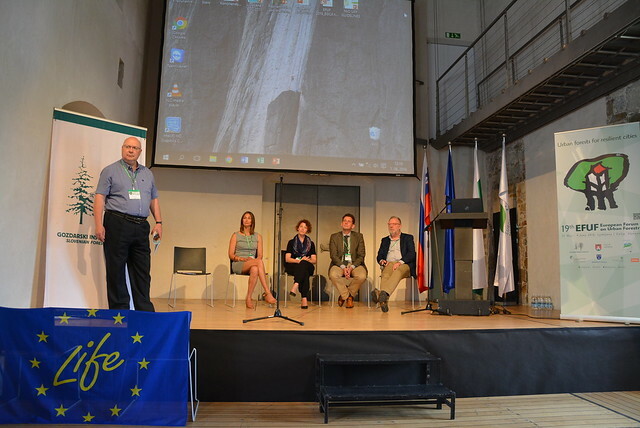 More than 80 researchers and experts in urban forestry and green infrastructure from all over the world gathered today in Ljubljana at the venue of Ljubljana Castle to attend EFUF 2016, organized by Slovenian Forestry Institute, Slovenia Forest Service, the City of Ljubljana and the City of Celje. “How to build cities that support life?” was the opening question of the EFUF 2016. Today the spotlight was on building the hosting city of Ljubljana, the European Green Capital of 2016. The city’s representatives presented efforts and achievements in environmental protection that could keep the city of Ljubljana green, healthy and beautiful; now and in the future. The introduction was followed by keynote speakers: Cecil Konijendijk van den Bosch, Clive Davies, Tara Zupancic, Simone Borelli and Natalie Gulsrud. They touched the subject of the past and future development of urban forestry. Once urban forests were mostly parts of a city with an aesthetic value for the city residents, but today their numerous ecosystem services are gaining more and more recognition. Higher levels of governance and management can play an active role in green infrastructure development, using different means to encourage city municipalities to build greener and more sustainable cities. If urban forestry was once only a Western concern it is not anymore; it has turned global and is growing strong in the developing countries. Prominent speakers also defined the term ‘resilience‘, the main theme of this year’s EFUF, and together with valuable contribution from GREEN SURGE and LIFEGENMON projects presented different aspects of resilience: from governance and management to public health and biodiversity. As we are recognizing the many benefits of urban forests and green infrastructure, we realize they might be the solution to many of our ‘urban’ problems. In the words of one of the speakers –“The green pill is all around us” – and there has never been a better time to invest in urban forests than now. EFUF 2016 continues tomorrow, moving to the second venue in the city of Celje. You will hear more from us soon, so stay tuned! The Slovenian Forestry Institute, the City of Ljubljana (European Green Capital 2016) and the Slovenia Forest Service are hosting the 19th European Forum on Urban Forestry conference with the lead theme “Urban forests for resilient cities”. The Forum will take place in Ljubljana and Celje, Slovenia, from May 31 to June 4 2016. The European Forum on Urban Forestry (EFUF) is an annual event that started 19 years ago. It provides a meeting place for practitioners, scientists and educators involved with the planning, design and management of urban forests – from woodlands to urban parks and street trees. Participants come from across Europe, as well as from other parts of the world – this year, scientists from North America, South America, Africa, Europe, China and others are registered to participate. Each Forum takes a general and a few specific themes where urban forestry can contribute and discuss. This year’s themes are the resilience of cities, public health and well-being, governance and management of urban forest and trees, and how they could bring the city to a spotlight – the promotion of a city. The first edition of the EFUF was held in Wuppertal, Germany, in 1998. The cities that hosted Forum are Aarhus, Budapest, Durham, Trondheim, Arnhem, Stockholm, Celje, Florence, Gelsenkirchen, Hämeenlinna, Arnhem, Tulln, Glasgow, Leipzig, Milano, Lausanne and Brussels. We know that there are many interesting things happening in cities and around them all over the world and many new scientific evidence has been collected during the last decade. We want to bring those in the spotlight – at the conference or on this EFUF 2016 blog. Why not take advantage of both opportunities and share your achievements, ideas, solutions or examples? On behalf of the Organising Committee, I warmly invite you to join EFUF 2016 in every possible way – on Facebook, on Twitter, write and comment on the #EFUF2016 blog and present your paper at the conference in Ljubljana!